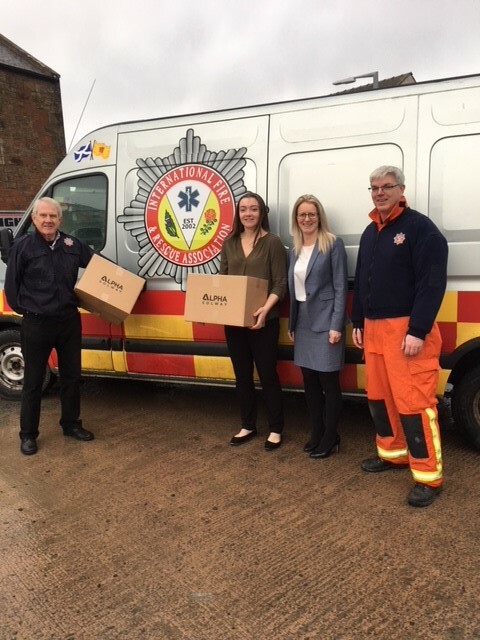 Leading Annan manufacturer Alpha Solway has helped the vital work of Scotland’s largest international fire service charity by donating a range of much-needed personal protective equipment. When the Alpha Solway team heard about the work of Fife-based IFRA (International Fire & Rescue Association) it stepped in to help by donating a range of products including chemical and foul weather clothing, disposable respirators and ‘cooling’ garments that reduce heat fatigue. The company, which currently employs 60 highly-skilled workers at its Queensberry Street premises, has grown to become a leading international name in the manufacture of protective clothing and supply of disposable respirators and hearing protection products. Its donation will help the IFRA carry out its work to provide firefighters and emergency services in countries affected by war, civil unrest and those unable to provide a fire service of their own with vehicles, equipment, advice and training. Since its launch in 2002, IFRA has supplied vital aid to 19 countries across 4 continents. “We’re delighted to be able to make a small contribution to the excellent work that the IFRA carry out around the world. Our products, made here in Scotland, are exported around the world to help protect workers across a wide range of industry sectors. It’s great to know this donation will aid people who are literally putting their lives on the line,” said Sherree Gracie, Operations Director of Alpha Solway. Earlier this year, Alpha Solway’s performance as part of Globus Group was a major contributor in the company achieving the 2017 Queen’s Award for Enterprise in International Trade, with the range of British-made protective clothing being increasingly exported to international markets including developing markets in the Middle East. Read the IFRA letter to Alpha Solway here.